December 10 Galaxy Club ? Dallas or Houston TX ? I remember this day being very cold, as the line for the theater nearly stretched around the block. We waited outside for at least thirty minutes that evening, but of course it was well worth it. I had been listening to Death since I was a teenager, and finally, at the ripe old age of 22, I would get to see Chuck and his band up close and in person. To my surprise and delight, local death metal veterans Legion (Muncie, IN) opened the show. My old band had played with them on several occasions, and I was already a fan of their work. Not surprisingly, they put on a thick and tight performance comprised of new and older material alike. As always drummer Dave Dalton was like a whirlwind behind the kit, and overall their set was killer. Next was Hammerfall, a band I was not familiar with prior to this show. 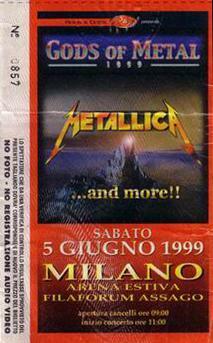 At the time I wasn't much of a power metal fan (I've since grown to love the genre), so I wasn't expecting much. These guys shattered any preconceived notion I may have had about this style of music, and put on a fantastic show. These guys were 100% metal, without a doubt! After much anticipation on my part, Death finally took the stage. It was quite a surreal moment for me, seeing him three feet away from me. I stood directly in front of Chuck the entire time, and for an hour or so that night, I was in Heaven. Here's a guy that I had admired for so long, on every level, and now there he was standing so close I could touch him. They opened up with "The Philosopher", one of my favorite Death tunes of all time. The set that followed contained songs from each of his seven albums. Some highlights for me included "Scavenger of Human Sorrow", "Symbolic", "Lack Of Comprehension", and the killer drum solo by Richard Christy. I was enthralled the entire time by the sheer aggression of Chuck's playing, especially during his solos. I remember that day clearly as if it were yesterday. 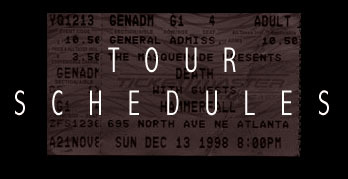 I was browsing the internet, and found the tour dates for The Sound of Perseverance tour. I immediately called my best friend Brandon, and told him that Death would be in Columbus OH 3 hours away, on Nov. 19. We both made sure that we could take off of work, and I went straight to Ticketmaster and bought our tickets. Nov. 19th arrives. I had been waiting for this day for years. We make the 3 hour drive in about 2 1/2 hours. We were going to meet a friend that went to Ohio State, and as we were driving we saw the tour bus sitting on the side of the street. That only made us more excited. We went and picked up our friend, and made our way back to the club. As we were approaching there was a small crowd. As we got closer, there was a note hanging on the door of Chelsies (that is the club they were playing). The note read. "The Death and Hammerfall Show has been Cancelled." Our first reaction was a laugh; we thought that someone was playing a joke. As the minutes wore on, we came to realize that it was no joke. Apparently the sound system was horrid, and would have made both bands sound horrid. We witnessed an argument between club management, and tour management. However, we stayed put, just in case something changed. About and hour later, we are standing there in the freezing cold, and Scott, and Shannon come off of the bus and start talking to everyone. I swear that we stood there for 3 hours in the freezing cold, and these guys were gracious enough to hang out with us. We talked about everything from music, to beer, to where we lived. Chuck had been on the bus sleeping. Finally he came off, and talked to everyone. We were so happy that we just got to hang out with the band that we really didn't care about not seeing them play. On the 3 hour drive home, we decided that 3 days later, we would make the 5 hour drive to Cleveland to watch them play. Just felt compelled to write. I was a dj for a metal radio show in Oak Harbor, WA. So I was always doing interviews with bands that I loved. I got the hook up to go see Death and Hammerfall. It was awesome. I was really digging Hammerfall because I thought they were getting back to the roots of metal. 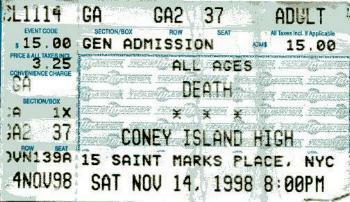 But obviously the crowd was there to see Death, and I myself was a fan from the Scream Bloody Gore days. Anyway, Death killed... just absolutely shredded the stage. Chuck was the ultimate presence on stage, even though he just stood there and jammed. So anyway, the show's over, and I'm sure he's exhausted. So I stood outside the bus, hoping to get an interview or whatever. Chuck was absolutely exhausted, but he VERY graciously grabbed my mini recorder, hopped on the bus, and did a few "liners" (where the artist says Hey, this is Chuck Schuldiner from the band Death, and you're listening to Assault & Battery). My point is, he didn't even have to do that, but he took the time. And I will always appreciate that.